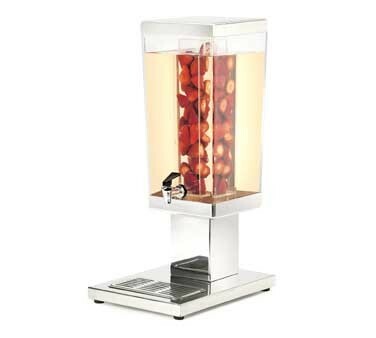 Impress your guests with an elegant yet stylish beverage service with the Cal-Mil 1282-3AINF Square Stainless Steel Polycarbonate Beverage Dispenser with Infusion Chamber 3 Gallon. Boasting a crystal-clear square tank, this BPA-free dispenser captures the look of delicate glass with the exceptional durability of polycarbonate. The perfect harmony of form and function, this premium quality piece invites guests to help themselves while its infusion chamber allows you to add flavors to your refreshments by filling it with sliced lemons and other fruits. Designed with convenience in mind, this beverage dispenser has an easy-to-use spigot for quick and mess-free filling. Thanks to its stainless steel base, this beverage dispenser is rust resistant and will withstand high-traffic, self-serve stations. For easy transport and cleanup, the spigot, infusion chamber, and base are removable.